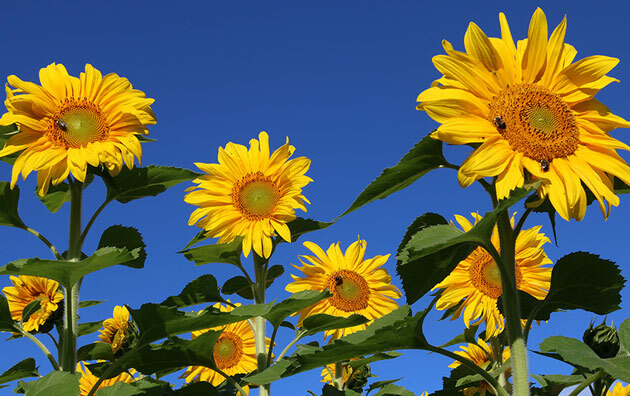 Above: Royal Hybrid Sunflower planting, abuzz with insect life. Beneficial insects need food and shelter if they are to control pests of vegetable, flower, or herb crops. An insectary planting of flowering plants will greatly increase the likelihood that predators and parasitoids will hang around and help out with pest management. An insectary planting can consist of an area reserved entirely for beneficials, or it can be made up of small, unharvested areas of valuable crops such as flowers and herbs. Here are the main types of plantings that can serve as insectaries in your farmscape. 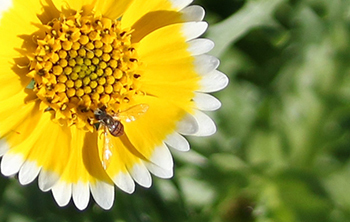 Hover flies are ardent consumers of aphids in their larval stage, and nectar-feeding as adults. Many plants grown to improve soil fertility and tilth are also attractive to beneficial insects when they are allowed to flower. Buckwheat is one of the best, especially because it flowers over a prolonged time period in summer. Though it is often regarded as a grain, it is not a grass but a member of the Polyganaceae, or the smartweed family. Other cover crops that provide food and shelter for beneficials include the clovers, hairy vetch, cowpeas, and alfalfa. Growing cover crops in numerous small sections throughout a field keeps the beneficials close to the cash crops. Often grown in strips among cash crops, grasses and grains provide refuge for ground beetles and spiders, and a shady place to lay eggs for other beneficial species. Although most species of grasses and grains are pollinated by wind (the technical term is anemophilous) rather than by insects (entomophilous), they provide insect-friendly habitat that is vital for the insects to perform myriad other ecosystem services. Apiaceae. Plants in the Apiaceae, or the carrot family, which is known as the Umbelliferae in some circles, produce umbels of tiny, aromatic flowers that are a good source of nectar. The family includes Angelica, Ammi, anise, caraway, Daucus (carrot), cilantro, dill, fennel, parsley, Queen Anne's lace, and asafœtida. Asteraceae. This is another large family that provides abundant and easily accessible pollen. Many cut flowers are members, including aster, blanket flower, China aster, coneflower, cosmos, goldenrod, sunflowers, tansy, and yarrow. Lamiaceae. The mint family produces tiny flowers with a lower "lip," a tubule that provides perfect access to beneficial insects (and hummingbirds). Members include bee balm, basil, catnip, lavender, lemon balm, marjoram, oregano, peppermint, sage, and many other strongly aromatic, multipurpose herbs. There are numerous additional plant family and species combinations that make companionable insectary plantings. Below is an example of one of the best — sweet alyssum, a member of the brassica family — companion-planted with onions, a member of the Allium family, to mitigate thrip pressure at Wise Acres Farm in Kenduskeag, Maine. Many mustard-family vegetables (Brassicaceae), including many Asian greens, broccoli, cabbage, kale, mustard, and turnips, can be left to flower for beneficials, then removed during fall cleanup. Sweet alyssum, as mentioned above, is a brassica family member cultivated as a flower rather than a vegetable. With small plantings made in and around our greenhouses here at Johnny's, its masses of tiny flowers are highly attractive to natural predators, such as ladybeetles, hoverflies and parasitic wasps, as well as green lacewings. Adult lacewings will feed on alyssum pollen and nectar, then lay their eggs. On hatching, the voracious lacewing larvae will help keep populations of aphids, mites, mealybugs, immature whiteflies, scale insects, and thrips in check. Because it prefers part-shade, alyssum can be planted beneath vegetable crops such as onions, to help control pests such as onion thrips, as in the example shown above. Permanent hedgerows provide refuge for many types of beneficials. Some flowering tree and shrub species to include that are especially attractive are black locust, elderberry, and golden bells (Forsythia). Species in the willow genus (Salix) are primarily pollinated by insects, as are those in the Prunus genus (plums, cherries, peaches, nectarines, apricots, and almonds), both wild and cultivated. This is only a generalized list of plant materials that can serve as insectaries. A large proportion of flowering plants, including both agricultural crops and those in natural communities, are pollinated by insects, and the majority of insects are either beneficial or neutral. If you look for plants in your area abuzz with insect life, those will make good candidates for farmscaping your fields and gardens. In regard to habitat conservation and avoiding invasive plant issues, remember that native plants attract and support native insects. The presence of insectaries on your land, or within your protective structures if you practice controlled environment agriculture, can enhance quality and yield, diminish the need for inputs, and support resource conservation. Johnny's offers a line of seed varieties known to Attract Beneficial Insects, including a Bee Feed Mix and our Beneficial Insect Attractant Mix, along with technical advice needed to successfully manage pollinator populations. 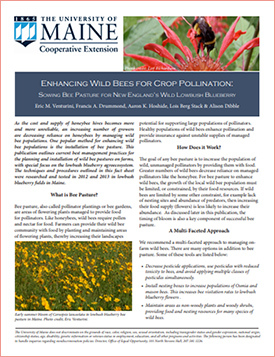 To learn more, see Attracting & Putting Beneficial Insects to Work and our list of further reading.